The North Carolina Anti-Saloon League was organized in 1902, with J. W. Bailey as chairman of its executive committee. Bailey, a native of Warrenton, was also a U.S. senator. Those involved in the temperance forces in the state had successfully eliminated the legal sale of liquor in many towns by using local option elections, a campaign led by Bailey. Many rural communities also eliminated the sale of liquor by obtaining acts of incorporation by the General Assembly. The Democratic-controlled legislature, at the urging of the Anti-Saloon League, passed the Watts Act in 1903. This law prohibited the manufacture and sale of liquor except in incorporated towns. In 1907 the Anti-Saloon League launched a successful campaign for statewide prohibition: in May 1908 voters approved a measure that made North Carolina the first state in the nation to enact a total ban on the manufacture and sale of alcohol. In January 1919 the Eighteenth Amendment of the Constitution was ratified by Congress, making Prohibition a national policy. Hugh T. Lefler, North Carolina History Told by Contemporaries (1948). 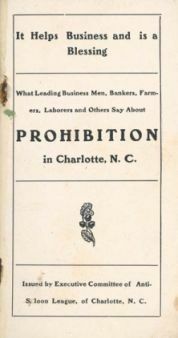 A pamphlet distributed by the Anti-Saloon League of Charlotte. Image courtesy of DocSouth, UNC. Available from http://docsouth.unc.edu/nc/antisaloon/antisaloon.html (accessed May 31, 2012).